Universal joint made with powerful NdFeB magnets. Body made of brass with tapped hold to mount on any surface. Can hold anything within stipulated load at any angle. 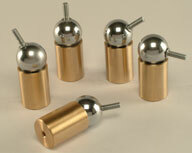 Ideal for holding component during machining operations in lathes. Imagination is the limits of its application.